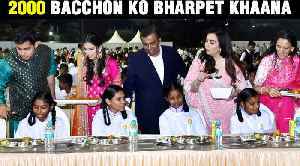 ▶ Videos for "Anna Seva"
Nita Ambani on 6th March inaugurated the Dhirubhai Ambani Square at Jio World Centre, Mumbai. Special 'Anna Seva' was organised to feed underprivileged children. The Ambani's nearly fed 2,000.. The wedding festivities of Isha Ambani and Anand Piramal have started in Udaipur where the families organised an 'Anna Seva' function.